This section provides tips on helping you to give practical care, how to respond to common symptoms and understanding your relative’s emotions. Someone’s medical history is usually a private matter but often we trust a few people to share this information with. Consider speaking to your relative about this. If they agree, you should consider asking them to complete a letter giving their written consent for you to access their health information. You should contact your relative’s GP surgery to discuss what needs to be in this letter and if you need someone to sign it as a witness. There is some further guidance available here though the legislation is different in the North and Republic of Ireland. If you are going to be the main carer for your relative, having written permission to both give and receive information on their behalf may make life easier for you all. People receiving palliative care often have to take a range of medications in order to control their symptoms. Medications should always be used as directed by a doctor. Always check the label and only provide medication as directed. Make sure you are giving the correct medicine and the correct dose. Not all medicines are tablets, some may be liquids and others given by injection or via a skin patch. If in doubt contact your GP or other healthcare provider. Sometimes people are given a list, from the hospital or GP, of what medicines are for and when to take them. If you have not got this information, talk to your GP or pharmacist – a summary list will make it easier for you to manage medications. Some medicines are given at set times while others may be given as required. For example, some pain medications should only be given if your relative is experiencing pain. If your relative takes a range of tablets, consider using a daily or weekly pill box. This allows tablets to be put in compartments making it easier for you to remember which pills need to be provided and when. These boxes can be bought or may be free from your GP or pharmacist. Speak to your local pharmacist – they may be able to provide you with a daily or weekly pack of all the medicines your relative needs. If syringes and needles are being used, ask about getting a ‘sharps bin’. These may be provided by your GP or pharmacist. Your GP or other healthcare provider can advise you about how you can safely dispose of a sharps bin. Often medicines are changed during someone’s illness. If a medicine is no longer needed it should be discarded to avoid accidental use. Return these medicines to a local pharmacist who can safely dispose of them. If you may need to use a medicine again, store it in a cool dry place away from the medicines you use regularly. Try not to run out of medicines. Keep an eye and as you begin to ‘run out’ of a particular medicine contact the GP to arrange for a repeat prescription. Where possible, avoid having to arrange repeat prescriptions at the weekend. Speak to local pharmacists some may provide a prescription delivery service. If your relative has difficulty swallowing, some tablets can be crushed and given with food or fluids. Check first with the doctor, nurse or pharmacist as some tablets should not be crushed and an alternative form of the medicine may be needed. Some people may need strong painkillers such as morphine. If required, your doctor, nurse or pharmacist will be able to explain why, when and how to use it. You can ask for written information explaining how to safely use this type of medication. Again, if in any doubt contact your GP. Your doctor may leave some medicines, in the form of injections, in a safe place within your home. These ‘emergency medications’ are prescribed in case your relative does not respond to their usual medication. For example, if a person is experiencing nausea, they may not be able to take tablets so the nurse or doctor may have to visit to give an injection as an alternative to their usual tablets. Some medications can have unwanted side effects. Your doctor or nurse will explain these. Side effects usually wear off in a few days as the body becomes accustomed to the medication. However, it’s best to prevent side effects in the first place so, for example, your relative may be provided with laxatives to prevent constipation or anti-nausea medications to prevent vomiting. Many carers worry about providing strong medicines. You should try not to worry, palliative care is based on the most up-to-date research and when medications are provided in the prescribed doses they should not cause your relative any harm. There are a number of things that you can do to try to make your relative more comfortable and to help them with their personal care.Marie Curie UK provides a number of resources on day to day caring. Assisting with your loved one’s personal hygiene can be done in a number of ways. You may be comfortable to ‘lend a hand’ and help to wash your relative’s face and hands or you may want to help them with a shower or bed bath. Your relative may also need help getting out of bed or getting to the bathroom. 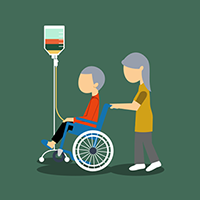 The nurse can guide you with any of these tasks or, if you are uncomfortable, the nurse or care assistant should be able to do these tasks for you. It is important to stay safe - to reduce the risk of falls consider having rails installed in the bathroom and where there are steps. You may want to inquire about getting a shower or bath chair so that your relative does not have to stand or, a hand held shower may make things easier. Your GP or healthcare provider may be able to arrange for an Occupational Therapist to visit your home and discuss the kind of adaptations or aids that your relative may need to lead as full a life as possible. Simple aids can be a big help. Consider carrying a plastic bag - placing it on a chair or car seat before someone sits down can make it much easier to carefully adjust their position. Many people receiving palliative care lose their appetite. This may be due to their illness or it may be a side-effect of medications they are taking. Whatever the reason, caring for someone who has little interest in food can be very upsetting. Try not to feel annoyed, your relative may have very little control over their appetite and eating may cause them to feel sick. Provide smaller meals more often, rather than three large meals per day. If your relative is losing their appetite, try to provide foods that you know they enjoy. Serve food on smaller plates and do not fill drinks to the top of the glass. Sometimes, because of the illness or medications, people’s tastes change. People may not enjoy foods they liked previously or may want to try different foods and textures. Chat to your relative about the kinds of things they may be willing to try. In some cases, your GP may be able to provide you with ‘fortified drinks’ (you can buy them in chemists or supermarkets). These drinks are high in protein, carbohydrate and fat and can help provide nutrition. Not everyone likes these drinks so you may want to try making your own juices or smoothies. For some people, a glass of wine or alcohol before a meal can act as an appetite stimulant. Before trying this you should check with your doctor as alcohol should not be taken with some medications. Good mouth care is very important. Encourage your relative to keep their mouth moist by taking regular drinks, wetting their mouth if necessary or cleaning their teeth. If you notice white ‘flaky’ spots in their mouth let the doctor or nurse know as effective treatments are available which can greatly improve oral comfort. As your relative’s illness progresses, you may notice that they are eating less. You should discuss this with your doctor or nurse but, at this stage, it may be less important to provide well-balanced meals and you should consider giving them small amounts of foods that they enjoy the taste and texture of without worrying about the nutritional content. Sometimes, people cared for at home require specialist help with managing medical devices designed to help with their treatment such as tubes, wound management, drainage systems, injections etc. Many relatives develop important skills at managing these treatment aids and help to manage their relative's care. Other relatives may not feel comfortable providing this type of care. If you are concerned about providing technical care, you may discuss it with your healthcare provider. They may be able to help you to learn these new skills or, you may prefer to leave all this technical care to a trained nurse (if available in your region). Some information that may help you to develop these skills is available here. WebNurse - Webnurse is an EU funded initiative that provides a suite of videos on caring for someone at home. The type of equipment you may receive will depend on your relative’s condition. Using equipment can increase your relative’s independence, make it easier for you to provide care and promote a safer environment. Information on the types of equipment that may be available to you is provided here. If you think these devices may help you, talk to your GP or nurse. They can assess your need, help you obtain equipment and demonstrate how it should be used. In some areas there may be a charge to hire some equipment. If you think any of the equipment listed below would help you to provide care for your relative you should talk to your GP or other healthcare provider. They can arrange to have a needs assessment carried out, help you to obtain the equipment and demonstrate how to use it safely. There may be a charge for some of this equipment. Shower chair – enables a person to sit safely while having a shower. Commode – a portable toilet that looks like a chair. Bath/shower hand rails – provides support when standing or sitting in a shower or bath. Bath board – enables a person to get into and out of a bath. Slipper pan/urinal – devices to allow someone to use the toilet while in bed. Absorbent or plastic sheets – place on a bed or chair if your relative is experiencing incontinence. Pill organiser or Dosette box – special container that helps you organise tablets to ensure your relative gets the correct medication at the right time. Syringe driver – a device used to deliver medicine below the skin rather than by the mouth. Speak to your GP or care team to enquire about this device. Sharps container – a box allowing you to safely dispose of needles and syringes. Speak to your GP or care team to enquire about this device. Call bell or intercom – a way to contact a relative or medical professional in an emergency. Hospital bed – a bed that can be used in your home that has sides to prevent falls and which can be raised or lowered. Bed stick – device which helps the person to sit up and get in and out of bed. Urinary catheter – a tube connected to the bladder to help your relative pass urine. Speak to your GP or care team to enquire about this device. Pressure relieving devices – special mattresses or cushions to improve comfort and prevent bed sores for those who spend a lot of time in bed or in a chair. Walking frame/rollator – a device used to provide support whilst walking. Wheelchair – allows a person to be mobile if they cannot walk easily. Slide sheets – slippery sheets that make it easier to move your relative around when they are in bed. Are you entitled to a Carer’s assessment? Available services vary across Ireland. It is useful to talk to a healthcare professional to find out about what is available in your area. In Northern Ireland you are entitled to an assessment from social services if you provide a regular caring role. They will look at your situation to see if you are entitled to any services that can help you provide care. In the Republic of Ireland, if you have a low-income and are providing full-time care you may be entitled to receive a carers allowance to help you. Complementary therapies are treatments used together with conventional medicine. They may not be available in all areas of Ireland and often, these are services that you may need to pay for yourself. Your relative will most likely experience ‘highs and lows’ throughout their illness. Sometimes they may feel angry, upset, grumpy or irritable and they may blame you or others for some of their emotions. However, at other times they may feel very positive. This is normal. Your relative may be thinking about a lot of issues and sometimes it may be easier for them to talk to someone else about these things; perhaps their GP, another healthcare provider or, a religious leader. Try not to be upset if they do not wish to talk to you and remember that you are not expected to have all the answers. As both you and your family member go through palliative care you are likely to experience a range of moods and emotions that are difficult to deal with. Providing some time alone each day, if desired. Asking if there is anything that you can do to make things easier. Suggesting some enjoyable things that you can do together. Asking if there is anything that they have a particular desire for. Remember that it is normal for you and your relative to feel downhearted from time to time. Encourage involvement in ‘day to day’ things like watching the news and participating in social activities. Remind your relative of the skills and different roles provided by your GP, nurse or other healthcare provider. Tell them how much you care for them and want to help them. Feeling worried or anxious most of the time. Finding it difficult to calm down. Feeling overwhelmed or frightened by sudden feelings of intense anxiety or panic. Experiencing recurring thoughts that cause anxiety, but may seem silly to others. Avoiding situations or things which cause anxiety (e.g. social events or crowded places). Experiencing ongoing difficulties (e.g. nightmares/flashbacks) after a traumatic event. If you or your relative have any of these feelings please make a healthcare professional aware. They may be able to advise you on strategies to reduce the feelings of depression or anxiety. Sometimes patients will make comments like “I’ve had enough” or “no-one should have to put up with this”. These types of comments are common and do not indicate that your relative is feeling suicidal but you may want to discuss the comment with them and see how they are feeling and what can be done to improve the situation. Spiritual care refers to a religious faith or a broader belief about the meaning of life. Not all of us have a religious faith, but we all have a spiritual side, a set of personal values and beliefs that guide us and give our lives meaning. The kind of spiritual advice that someone is likely to want will depend on their beliefs. If you are unsure about what kind of advice or support your relative would like, you could have a conversation about this. Would you like to talk to a priest or minister? Is there anyone you would like to talk to about spiritual matters? Do you have any concerns at this stage of your life that you would like to talk over with someone? If your relative attended religious services, but can no longer go, you should talk to a member of the clergy who may be able to visit your relative at home. At a time of crisis, maintaining these links can lead to a greater feeling of community and can bring a sense of relief. Remember, even if your relative has never been particularly religious or spiritual these issues may arise at some point during the palliative journey. You may want to get spiritual support from your local priest/minister, a chaplain in the local hospital or hospice or, your relative may feel more comfortable discussing these matters with a relative or friend. If you do not feel that you can provide spiritual help as well as providing physical care remember, it is okay to ask others for help. Other spiritual matters may include reminiscing about life with you or another family member or friend. This gives people an opportunity to celebrate their life, to laugh or cry and ‘tie up loose ends’ with family and friends. How much should patients be told about their illness? Your relative may not want to be told about the seriousness of their illness. This means that you, as their carer, may have to obtain all the relevant information and be involved in making decisions. Your relative may ‘know’ that they have a life threatening illness, but may prefer to avoid any discussion of the subject. This may place a great burden on you; seeking help from your doctor or another health care professional is essential. Depending on your relationship with your relative, and the way you have discussed difficult issues in the past, you may ask, ‘Can we have a chat about this with someone else here?’ A healthcare professional can help you with this discussion. Remember also, that some patients who have previously refused to speak about their terminal illness change their mind, so be prepared for the unexpected! On some occasions family carers think that their relative should not be informed about their diagnosis. This may be because they think that their relative will not be able to cope with such news. Or, there may be specific cultural reasons why it is not appropriate to talk about death and dying. However, people with a life threatening illness commonly want to plan and make decisions about their place of care, put their affairs in order, say their good-byes and be protected from unnecessary medical interventions. It is very difficult to keep information from relatives. As one person put it: “Truth may hurt but deceit hurts more.” Your doctor and other healthcare professionals will be experienced in having open discussions and answering family and patient queries about the impact of the illness. Many patients and carers are keen to try ‘just one more treatment’ in the hope that it provides a cure, or postpones death. Other people believe that ‘stopping treatment’ is the same as ‘giving up’ or accelerating the person’s death. You should be reassured that a key principle of palliative care is that treatments will only be offered if it is going to improve the person’s quality of life. That’s why treatment such as pain management will remain right until the end. When medical treatment is likely to make your relative more comfortable then all aspects of palliative care will be explored (physical, psychological, spiritual, cultural and emotional) together with support for you and your relative.